Anyone know what Discount Tire uses? They applied some on my tire and it's been great! I like the McGuire's Gel, the sprays get all over the place and don't seem to do as good of a job at lasting. My choice for "getto-drip" is Armor All Tire-Shine Gel with applicator foam sponge. It works and does not make a mess. That stuff is crap. It works great, but needs to be reapplied after an hour. No sling, but it like evaporates or something. armor all is FTL. Meguiars all the way baby. Let it stand for at least a half hour, in the shade works best. There's a direct correlation between sling & heat, and clean tires & long lasting shine. Hot day = more sling, gel applied to dirty tires = short shine. and so far I'm more than happy. It's just as good (so far) as Meguiars, but sooooooo much easier to apply. It's not runny like their Endurance gel, it's much thicker and with a groove in the middle of the applicator you spill absolutely nothing unless your tourette's is having that time of the month again. Last edited by MrGregski; 08-20-2008 at 05:59 PM. isnt meguiar's one of their sponsors? 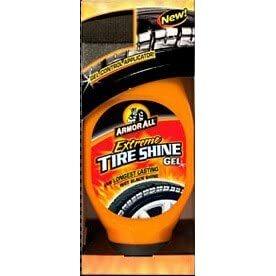 Thats what I use too and it def works good for me too, like someone said before just make sure you pull up a little bit the get the bottom and make sure when u just washed the car to scrub the tires too and this lasts about a week for me as long as the weather is nice. 2003 GGP Sportdesign - Starting the modding all over again! oh yeah? All i saw them do is dip this toilet brush end into a bucket and apply onto my tire! I've been using Pinnacle's wheel gel and it works great and also have some cleaning agents in it as well. i tried black magic and meguiars hot shine... its been years since someone has posted on this thread, anyone got anything better? Ive used almost everything out there. Turtle Wax ICE sprayed on a rag then applied is the best stuff ever!